Entitlement and eligibility for Maternity Leave & Paternity Leave for employees in Singapore. Adding Child's Details in Next-of-Kin. A female employee who has worked at least 3 months before the birth of the child is entitled to maternity leave. 16 weeks of maternity leave. the first 8 weeks are paid by the employer while the remaining 8 weeks are paid by the government, for the first 2 child births. All 16 weeks are paid by the government for the third and subsequent child births. to be taken in continuous weeks starting 4 weeks before child birth; first 8 weeks can be taken within 4 weeks of child birth with the remaining weeks taken flexibly within 1 year of child birth. total flexible leave days = 8 weeks x number of work days per week (capped at 48 work days). 12 weeks of maternity leave. 8 weeks are paid by the employer for the first 2 child births while the remaining 4 weeks are unpaid. total flexible leave days = 4 weeks x number of work days per week (capped at 48 work days). 2 weeks of paternity leave. 4 weeks of shared parental leave if the wife agrees. each week is paid by the government, capped at $2500 per week inclusive of CPF contributions. to be taken in a continuous week within 16 weeks after child birth or flexibly within 1 year of child birth. the total number of leave days = number of work days per week (capped at 6 days per week). 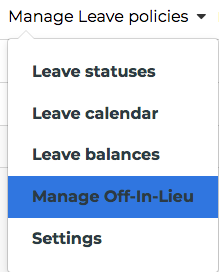 Step 1: Under Manage-Off-In-Lieu, create a new Adhoc - OIL and renamed it to Paternity Leave. (Disclaimer: You can name it as you see fit). 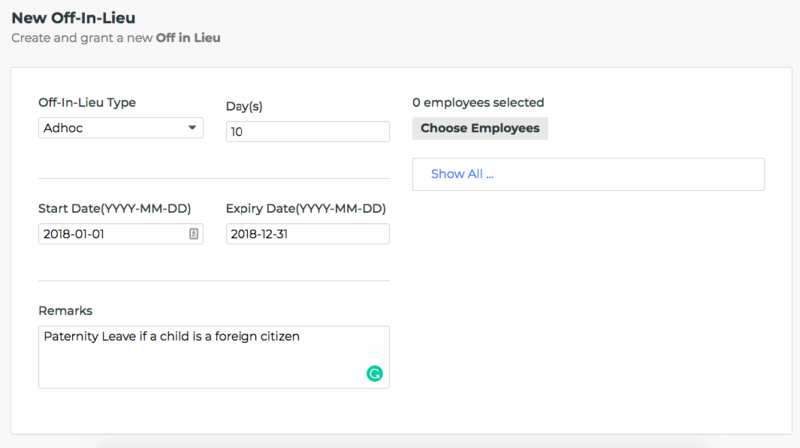 Step 2: Do remember to add the affected employee so he/she will be able to apply this leave. 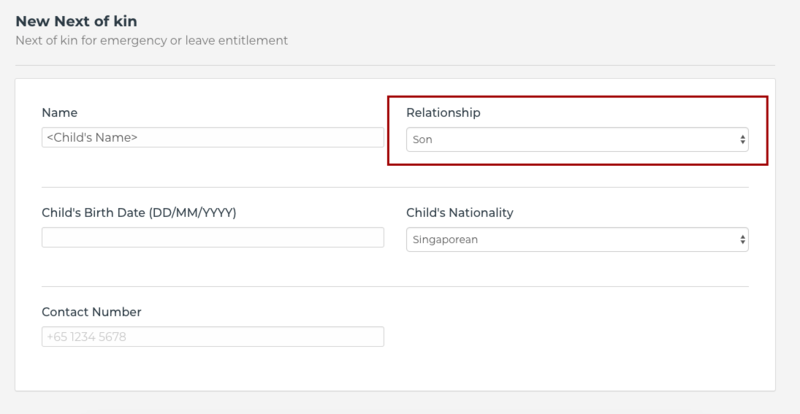 Step 3: Under the employee's Adjust Leave tab, you will need to key in the leave adjustment amount in the Quantity field to deduct the original Paternity Leave to avoid duplication and confusion for the employee. Do add a Reason for clearer indication. You can also follow the above steps if you want to create a custom Paternity Leave (Flexible Arrangement, by mutual agreement) if your company allows your employees to apply in Days instead of 2 weeks continuously (Default Arrangement by MOM). How can your employee be eligible for Maternity Leave or Paternity Leave? 2. Update the employee's Marital Status. How do you claim from Government-Paid Maternity Leave (GPML) Scheme?